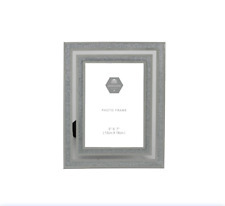 Silver 925 picture frame. Brand new in box picture frames. Condition is New. Dispatched with Royal Mail 2nd Class. Ornate Mirrors. Can be hung in the landscape or portrait position. Round Mirrors. Complete with plain glass and brackets. Available in silver gilt, gold gilt, black or ivory. Just wanted to drop you a quick note about the mirror we ordered. This beautiful silver frame has the full English silver hallmark for Birmingham 1899 and has the makers mark, 'HM'. The silver rococo section is made out of a good gauge of silver and is adorned with typical swirls and flora. Sadly there are several polish holes, these tend to be on the large raised swirls. The back and stand are original and it looks like the material between them has been braced at some point in the items lifetime (this old mend remains strong, however). The item measures 32cm X 28.4cm with an internal picture size of approximately 20cm X 15cm (roughly 6" X 8"). The item has its glass. 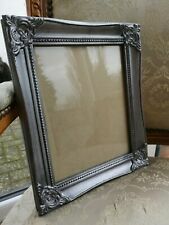 Photo frame, silver, brown, flower design, antique style, homeware Dispatched with Royal Mail 2nd Class (2 to 3 working days). These large frames are each marked 'silver plated' and are made by Richard Carr of Sheffield. They are the same model though they have different coloured velvet backs and a different coloured interiors (see pics). Both have their glass and are in good condition with no plate wear. Each frame measures 27cm X 20cm (10 1/2" X 7 1/2") with an internal photo size of 18.1cm X 13cm. Picture Size: 3x2. We will try our best to provide you with a satisfactory resolution in most peaceful and respectful manner. For more variety of unique products. Any requests for order cancellations after the period of 30 minutes will bedenied. Ornate Mirrors. It can be hung in either the landscape or portrait position and looks amazing when hung in both contemporary and traditional settings. 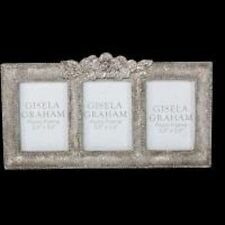 Available in silver gilt, ivory, gold or black. This silver frame has the full English silver hallmark for Birmingham 1903 and has the makers mark, 'AJ'. The frame is quite worn with a few dings around the plainer circular section and a repair to the 'swirling' corner by the hallmark (see pics). It has a replacement wooden back which works effectively. The frame measures 18.2cm X 18.2cm with a circular picture diameter of 10.5cm. Made from resin - basket weave effect. Flower decoration at the top. Add to Favourites. Garden Lighting. Garden & Patio Furniture. Garden & Patio. Candles & Tea Lights. Wall Hangings. Chests of Drawers. Cabinets & Cupboards. It is made of sturdy cast stone and can cross and upright be erected. Color Silver. Cancellation form. Info Links. Follow Aubaho. It is made of sturdy cast stone and can edgewise be erected. Style Antique style. Cancellation form. Info Links. Follow Aubaho. It is made of sturdy cast stone and can cross and upright be erected. Style Antique style. Color Siver. Cancellation form. Info Links. Follow Aubaho. As seen in the photos, a high quality and decorative work in antique style. By consuming handwork of products traditionally processed to obtain an antique appearance. Each object is therefore unique. Evergreen Narrow Edge Brass Single 5x7-235B01-5R (6) 5 x 7-inch . Box Contains 1 x Narrow Edge Brass Single 5x7. We are only happy if you are happy. Need help?.